This is it. I have finally finished my semester in Australia. It really is bitter sweet to think about since it only feels like yesterday all of us were talking about how much time we had in Australia. Four months really does fly by. Being consistent with the blog the last few weeks was almost impossible since I had to start buckling down for finals. There was not much I had to talk about with everyone so for a brief moment I will recap a few of things that happened after I came back from break. I guess I will start with small things that happened. This involved many different BBQ’s I went to. I spent some time at the other student housing complex called varsity where I took part in BBQing some food with various international students, some of whom I knew from my trip at Byron Bay and Mojo surf camp. It really was a great way to bond and meet new people. Another BBQ that happened was Alyssa’s birthday where everyone gathered at Maloolaba and cooked some sausages and burgers. It was a great time during the week to de stress and even have a run in with some Elon University alumni who interrupted our festivities to just come by and say hello. One of the guys, who’s name I have sadly forgot, graduated with a major in political science and was part of Model United Nations at Elon, which funny enough I am apart of. They mentioned they all graduated in 2013 and said how much they loved studying at USC during their study abroad experience that they decided to travel Australia. It was an interesting run in that reminded me of the friends I have been missing back at Elon. They also reminded me that my time in Australia was limited. wheel type floaties, and some are just walking trails where you can easily slip back into the water. That was where I was. Picture a bunch of little kids playing around on these obstacles and five adults as well. We were only allowed on there for a specific amount of time but it felt like time went by too quickly. You really are never too old to feel like a kid again. After we finished our time there, there was a spot where wake boarders are pulled by a cable around the lake. Normally, I love to wake board so naturally I gave it a go. Just trying to get up was almost impossible. It was very different from being pulled up by a boat. After many failed attempts I was able to get up at least twice and go around the path before bashing my head after the cable changed direction and my board caught an edge. All I could say was, I had a huge headache and had to lie down after all that. It was completely worth having that experience. That week, Halloween was coming up. Surprisingly enough, Halloween has become popular in Australia so I was able to dress up. The Thursday before Halloween, Daniel took a group of us to Aussie World, an amusement park that was not far from the University. Some of us dressed up and some didn’t. We went on a few rides, were followed by some creepy guy dressed in a creepy clown leotard, and went inside a haunted house where I lost my hat running through a room full of hands hanging from the ceiling. That wasn’t the only thing that scared some of us. There was a creepy lady who had a little crush on Liam and was following our group around as well as that guy with the creepy clown leotard that scared the life out of Dorthea when he popped out during our time in this strange maze of mirrors. Needless to say it was an interesting night for us. 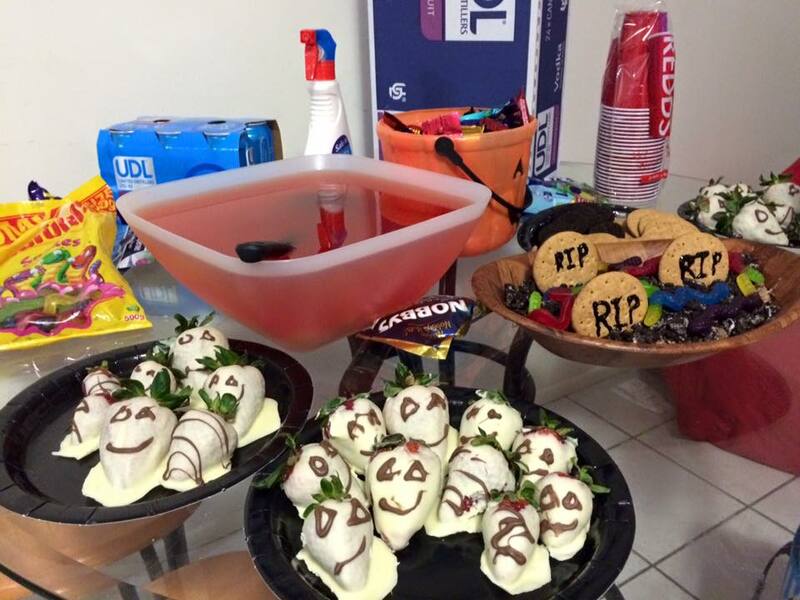 Saturday, I held a little Halloween party with some food and blood orange sangria. 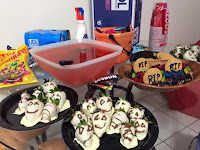 People came in and out since that was how Halloween works at uni but all in all, it was relaxing and fun. We eventually headed over to Varsity (the other student housing) to join the many students mingling and dancing. By the end of the night, a few of us just went for a walk around the university before heading to bed. 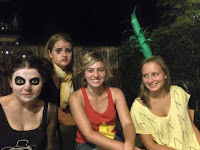 Though I was not having an Elon Halloween, I still enjoyed dressing up and spending my Halloween in the land down under. and Crocs watching. 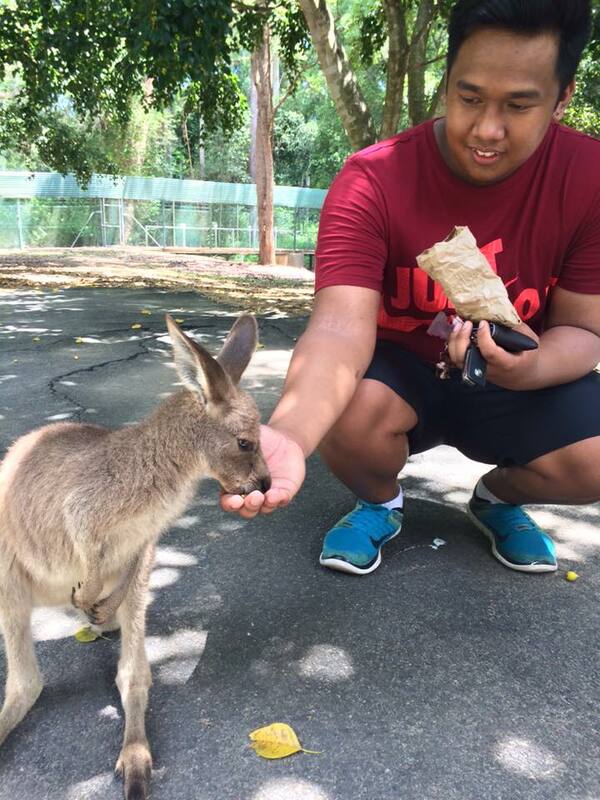 We got to feed some Kangaroos who looked so tired and lazy. 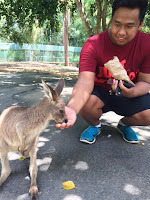 Raffy named every single one of them and even made friends with a joey. Once we had our fill of Bindi’s Island and kangaroos, we went over to grab some lunch at the main stadium before heading over to see the big croc feeding. It was a crazy sight to see this saltwater croc named Echo crush the head of a dead pig with just a snap of his jaws. Turns out that Echo was caught by Steve Irwin in 1988, which meant the staff had no idea how old Echo was. Going to the zoo was in general an amazing time before we got rained on. It really was an opportunity that I am glad had a chance to take. As finals came closer, my stress levels became higher and I ended up spending my last two weeks preparing and taking my four exams. Once I walked out of my Abnormal Psychology exam I finally could breath. That same day I went with Cara to Colondra to walk around and enjoy the beautiful sunshine and heat of summer. We walked along the beach as well as explore the little town and reminisce about the times we have had here at the Sunshine Coast. Flo and his mother were very sweet in taking us back to campus where I said goodbye to him and later Cara. Everyone else that day had left for home so I was one of the few left at UniCentral. The next day I met with Woody Pelton, the dean of global education at Elon University as well as a bunch of the other Elon students that were studying at University of the Sunshine Coast. We had lunch and talked about our experiences as well as the advice we would give to incoming Elon students that want to travel abroad to this program. It was interesting to hear what everyone else has been up to and how excited everyone was to go back home but sad to leave this place. Along with talking to Woody, we also got to talk to a few USC students who will be joining the Elon community this spring. Two are locals of Queensland Australia and the other is from Norway. Our group was so excited to tell them about how much fun they are going to have when they come to Elon. I even slipped in that they should look into Model UN as one of their club choices. The rest of the day I was cleaning out my room and packing as much as I could. The next day I woke up at 8:00 so I could make breakfast and meet up with Dorthea one last time before she left for Harvey Bay. We jumped on a bus to Alexandria beach to catch a few waves. It was a bit windy that day but we made the most of it after being knocked over by waves, violated by seaweed and almost running into each other. I caught only three waves but that was enough for me since I wanted to at least catch one before I left. We were at the beach relaxing for a while before returning the boards and heading to grab some lunch. From there we walked back to the bus and headed back to campus. We said goodbye before parting ways. Dorthea if you are reading this, you better come to New York for thanksgiving in the next few years!!!! Once I made it back to my room, I went to the pool to relax before finishing most of my packing and cleaning up my room. For my last day, I decided to treat myself to a pedicure as well as a walk around the Sunshine Plaza one last time. I was able to grab some last minute things as well such as a better nose stud and some small gifts as well as a huge collection of TimTams because why not? I even got to see some parts of the mall I had not explored yet which made me a bit mad since the Sunshine Plaza I did not spend as much time at. After I finished getting my toes done, I was not done yet with the general area I was in. I jumped on a bus and got of near Alexandria Headlines Beach to walk to pathway and check it out before I headed back. There was a kayaking race happening at that time and I felt compelled to watch at least one of the races since they were close to the surf lodge. The waves were ruff and it was windy but seeing those kayakers push through the waves was an amazing sight to see. I even walked up to the hillside of Alexandria where I could watch one more race before walking towards Maloolaba to catch the next bus. I took a detour through the lush green trail around the cliff sides to where we had Alyssa’s birthday party before arriving at the bus stop. I watched Maloolaba disappear as the bus pulled away and felt myself lost in my own thoughts until I made it back to UniCentral. After a dip in the pool I finished my cleaning and packing and had my last meal of noodles in a cup. My roommate Ari was doing laundry while I talked with her and her friend Kristin. It was great to have them as the last uni students I spoke to on my last night. We talked about how fast the time went and how much we did not want it all to come to an end. The two of them are doing some traveling of their own before they head home to Germany, which I am a bit jealous about. I still have that travel bug and it will not go away. All in all, my last night was perfect! The only things I did not get to do sadly were cage diving with sharks, going to Fiji and riding a sea turtle. I did hang out with a Grouper so I will take that as a check. 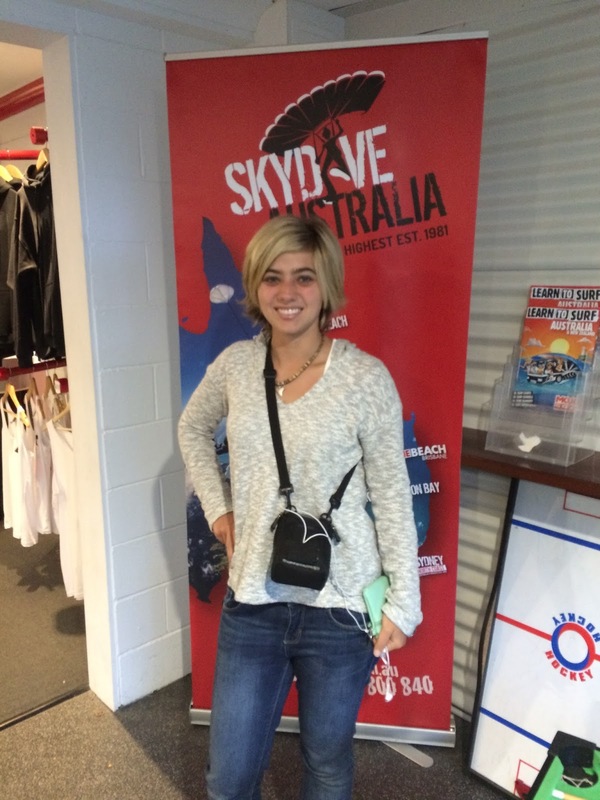 This was not on my list of things to do but it was on my bucket list and that was skydiving. I can truly say I used my time wisely when I was not locked in my room or Uni studying. One thing I would give advice to any study abroad student is that yes your grades matter, but do not miss out on opportunities when you are abroad because you have to get straight A’s. You would not be using your time wisely. The school system was difficult compared to what I do at Elon but I was able to get by enough. As I write this, I am sitting in the airport waiting for my flight back to the states. It’s going to be a rough flight back but I am happy to see my family once I arrive in New York. I will never forget my experience in Australia and I hope to return one day to this amazing country. Thank you to Elon University for allowing me to have this wonderful opportunity to study abroad and to my family for letting me stay across the world for four months. Thank you to my friends at Sippy Downs for making this an amazing experience and I hope to see you all in the future! Goodbye Australia and hello New York! These past ten days have been the most exciting days of my life. This has been the first time I have ever done a trip on my own with just one friend in a different country. One might think this was a very nerve wracking experience. In reality, this has opened my eyes to a whole new world of traveling. Drothea and I started our trip in Melbourne where we stayed with my cousin Lindsey, James, and their new puppy Eloise. Side note, this puppy had 3 different names while we were there before they finally picked Eloise. On our first day, we explored the hipster section of Melbourne called Fitzroy where Lindsay works. We walk around, admired the graffiti and shopped at a few places. After lunch with Lindsay, Dorthea and I walked from Fitzroy all the way to the main city of Melbourne to drop by James’s juice press shop called Green Press. We had some delicious smoothies and played with miss Eloise who was chilling in her little bed. We drove back to Port Melbourne to get ready for a fun dinner with Lindsay, James, James’s brother Miles and one of James’s childhood friends. This ended our first full day in Melbourne. is the only place where graffiti artists can paint their works of art without having to worry about the police. Dorthea and I ended up taking pictures and admired the street art that was all around us in every corner of the ally way. 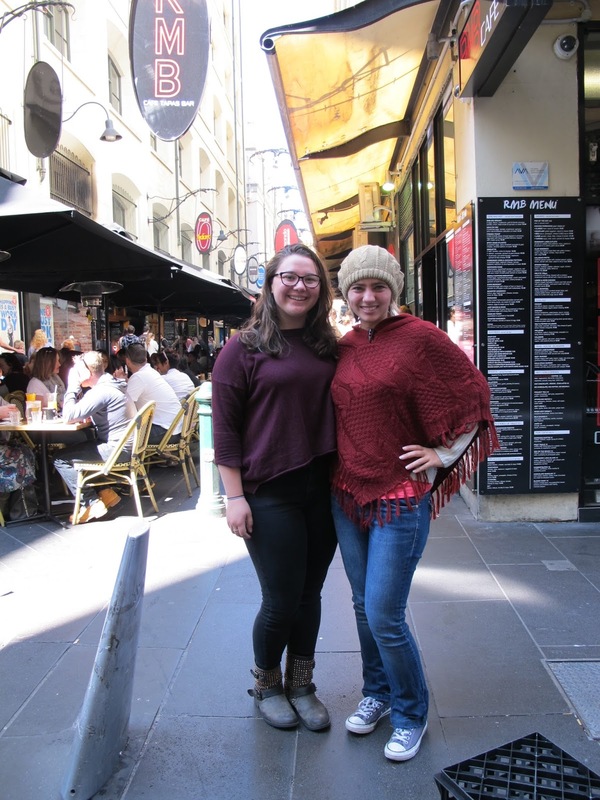 As we left Hosier lane to explore the area, we ended up walking along the river for a while before jumping on a train to go to Brighton beach. The beach is outside the city and has this line of colorful house sheds along the beach that all have different themes to them. We took pictures and walked along the beach before finding a café to sit down and relax. Lindsay picked us up and we drove back to the apartment where we played with little Eloise bean and relaxed. James and Lindsay made us a delicious dinner that night as well as introducing us to GayTime ice cream (which side note is the best ice cream ever invented). On our last day in Melbourne, Dorthea and I slept in a bit before grabbing brekkie with James, Lindsay and Eloise. 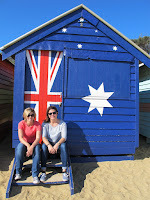 We went to a cute place in Port Melbourne where we had coffee and some eggs. designs. Once we reached the end of the street, we ran into Luna Park, which looked very similar to Koney Island back in the United States. As we walked passed the large entrance we caught a glimpse of a group of young adults singing and playing music. As the sunset over St. Kilda beach, we jumped on a tram and headed back to the apartment where we packed up and headed to the airport. t still has the feel of a city, which is similar to the city of Boston and the weather of Seattle or Chicago. It was so great to see Lindsay and James again. I was happy to spend some more time with my only family in Australia as well as get an insight to the life here in Melbourne. Dorthea and I want to thank them for the billionth time for letting us stay with them during our short time in Melbourne and for giving us great suggestions for sights to see. We were able to see all of Melbourne in a short amount of time. I guess you can say we know how to schedule our time. of us took a long nap before exploring the city. We were suggested to see Takapuna beach, which was located outside the city. Once we figured out the bus system, we arrived in Takapuna and started to walk around. The beach was not as beautiful as one would expect but we were able to see an inactive volcano across the water as we walked up and down the beach. The weather was a bit gloomy but that did not stop the locals from playing Frisbee and going kayaking. Eventually the two of us went to the grocery store to grab some food for the week. We walked back to the bus station to head back to the city. 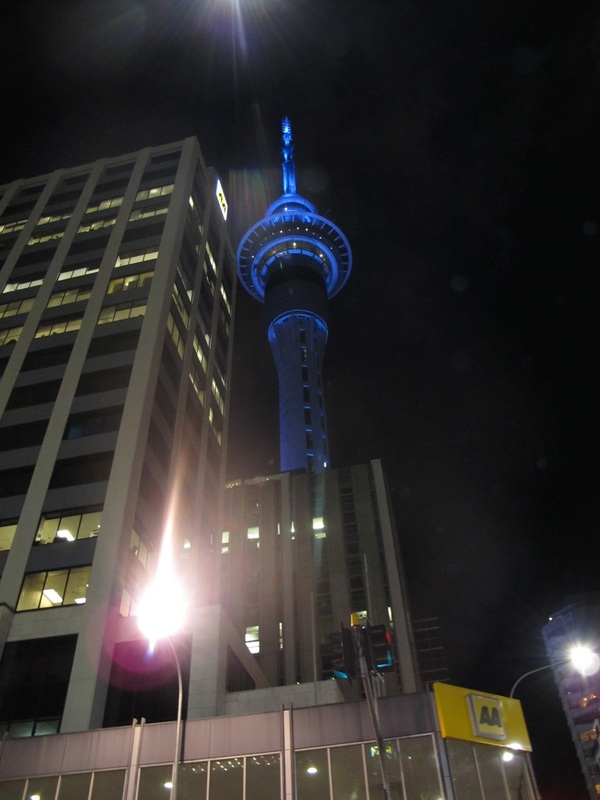 Instead of getting on a connection bus back to Gray Lynn, we saw the Sky Tower when we got off the bus and decided to check it out. We bought tickets to go to the sky deck which gave us a beautiful view of the whole city. We took another hour at the Sky Tower Café where we bought some drinks and gazed at the beautiful lit up city of Auckland. Afterwards, we caught the next bus to Grey Lynn and planned our road trip to Mt. Ngauruhoe (aka Mount Doom from Lord of the Rings). few times to gaze upon the beautiful rolling green hills that were all around us. As we drove through farmland, we took another wrong turn and ended up at a little lake where we took a small break and grabbed a bite to eat. The weather had gotten warmer so the three of us took a dip in the freezing cold water before jumping back in the car to find the nearest gas station. Once our tank was filled, we ended up stopping again at another view of the lake. There was a man who told us that we should go and visit his village, which was three minutes down the road we were on. Taking his suggestion, we stopped at the native village to take a look around. It was tiny but was right on the water. Steam came up from the sand, which was due to the volcanic fumes that warmed up the water and the rocks. 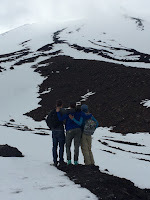 Did I mention we were in a volcanic active area? After a long trip of seven hours, we finally made it to the hostel called A Plus Lodge. This hostel was located 30 minutes from the starting point of our hike and was located in a little town called Turangi. It was the strangest looking place but we slept in some comfortable beds for the next 2 nights. Since Kasper and Dorthea drove the whole way, I made a nice spaghetti and meatball dinner for the three of us before we called it a night. unprepared next to the tour group with picks axes, snowshoes, and helmets. We followed the tour group up the snowy peak, as it got steeper. The group in front of us was too slow so our group walked around the tour group in the new unpacked snow up the mountain. the end. We still had a long way to go from our lunch spot. As we continued, we saw parts of the mountain steam up. 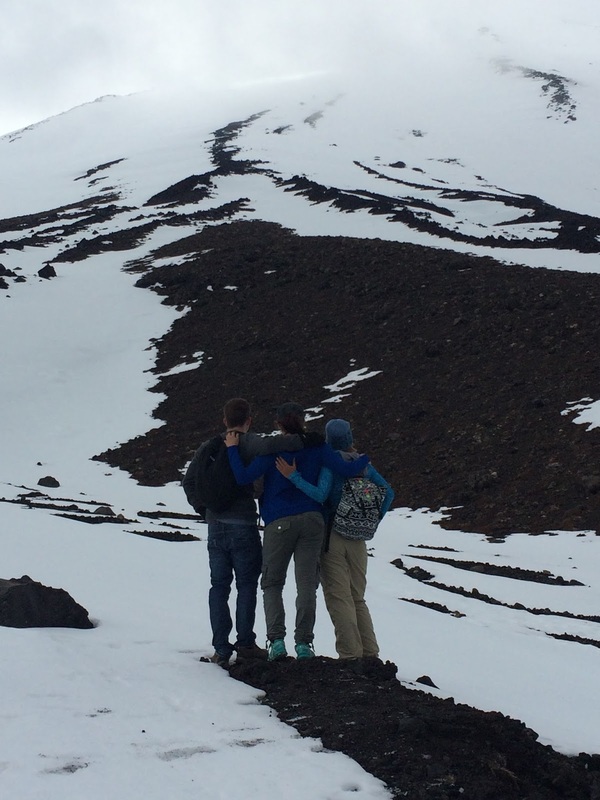 Turns out we were in a section where two volcanoes were active. The area smelled like sulfur and most of the area was brown and dead. Soon, we made it to the forest area. This was the last section of our hike. There was a river, and beautiful lush woods. We finally made it to the end of our hike, which took exactly 6 hours to walk 19.8 km (this is about 12 miles). We were driven back to the car then we drove into the small town of Turangi to grab pizza for dinner since no one wanted to cook after all that. Once we picked up dinner and went back to the hostel to eat, we went to the hot pools to relax our muscles after the long hike. Due to volcanic heat, there were many hot springs in the area, which were turned into hot pools for locals and guests. It smelled bad but my muscles felt so loose afterwards. When we returned to the hostel, we had a little dessert and went to bed. so we could go to the glowworm caves on our way back to Auckland. We added a fourth person to our road trip that we met at the hostel and was heading in the same direction. Her name was Stacy and was from South Korea. So we had two Danes, one Korean and one American on our road trip back to Auckland. We entered a dirt road with a lot of potholes in order to get to the caves. After fearing that one of our tires would pop on the trip there, we finally made it to the caves. Most of the glowworm caves in the area were guided tours but we wanted to go somewhere where we can explore ourselves. With our small flashlights, the four of us entered the cave, which was dark and had a little stream going through it. We saw rocks, glowworms and even a big spider. After a while we walked back out into the sunlight to rest and have a snack. pictures, we went down to the couple to say thank you for letting us explore their farm. They ended up inviting us into their home to have some dinner, which was the most amazing hospitality I have ever gotten from strangers. 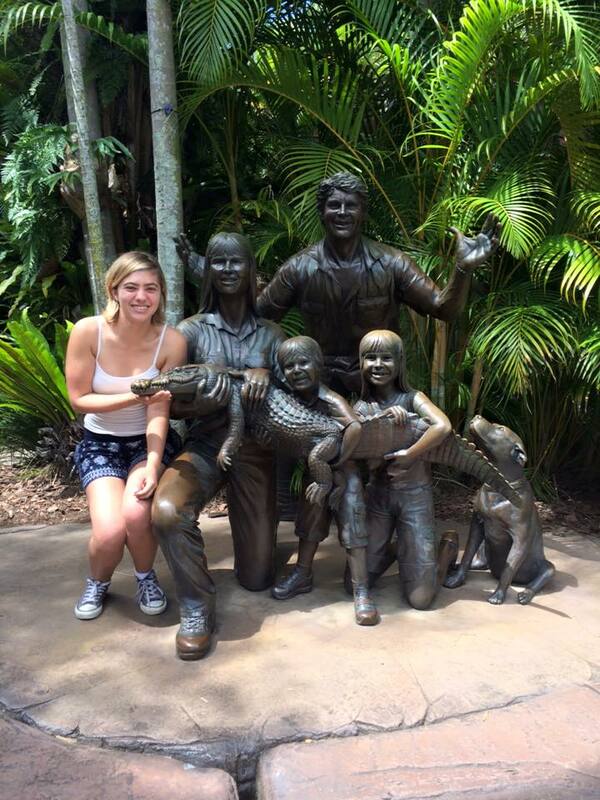 The couple was named Margret and Louis and they have come across visitors before. The food was delicious and was the first time having a home cooked meal since I have been on the other side of the world. They even sang happy birthday to Kasper as they served us a delicious dessert that Dorthea and Kasper told me was similar to a Danish dessert they have back in Denmark. It was peaches and apples with crumble, ice cream and yogurt. There is a name for it in Danish but I cannot pronounce it. After talking with the lovely couple and their kids, we had to head back to the rental place since it was very dark. We thanked them a thousand times for their hospitality and dinner before we jumped back into the car and headed back to Auckland. The next morning, Dorthea and I slept in late before going to breakfast. We then went to the grocery store to buy ingredients for the dinner and lunch we were making for Kasper. For lunch, I made fluffy pancakes with strawberries and syrup and for dinner, I cooked Chicken Parmesan and Dorthea made meat ravioli with sauce. This dinner was our way of saying thank you to Kasper and his flat mates for letting us crash with them. Kasper had a little gathering for his birthday that Dorthea and I attended. If I can sum up what the party was, it was me and a bunch of Danes. They all sang happy birthday to Kasper in Danish and we mingled until 1 am. before we continued through the town. After walking into a few shops, we decided to eat at this little café called Circus Circus. The theme of the café was exactly what the name described. We sat there for hours eating and talking before we decided to head back to the flat. Before bed, we planned for our final day, which was going to the infamous Hobbiton. made the movie more realistic. Most of the shots in the movie were at locations you can go to now, which I find amazing. I was just so happy to be able to see the beauty that went into this franchise. To any Lord of the Rings fan, I highly encourage you to visit this location though it is a very touristic sight. You will have so much more appreciation for the movies if you see it for yourself. Once we jumped back on the bus, the three of us were back in the main town of Matamata. We grabbed some lunch before we called it a night on our last day in New Zealand. fun adventures. We defiantly were lucky to have a guide with us! Summing up New Zealand is almost impossible for me to do. This country was just gorgeous from its city to the rolling green mountains. The sights I saw were postcard worthy shots. Never have I seen such beautiful nature! I went into this trip thinking I was going to be let down when we got to New Zealand. Instead, it exceeded my expiations tremendously. Dorthea and I only were able to visit the Northern Islands, which I was told is not as good as the Southern Islands. I don’t know anything about the southern islands but if they are any better than the northern islands, it must be drop dead beautiful. The weather we also lucked out with because the area we were in was known for a lot of rain. The days we were hiking and exploring it was sunny and beautiful where the days we were relaxing it poured. Guess we really did luck out with weather on this trip! We walked and explored so much during our time in New Zealand; I would have loved to stay longer to see more. the time we had together for our break. This whole trip was not planned at all. When I mean not planned I mean the only thing we knew we wanted to do was go to Melbourne, then go to New Zealand and see Mount Doom and Hobbiton. The one thing we originally planned that did not work out was going to Wellington to see David Duke about Weta Studios. Turned out Wellington was really far away from Auckland. We did not know what days to do our activities. Melbourne we knew nothing about yet we basically saw the whole city. Part of the reason this worked out for the two of us was one, we had people living in the areas we were visiting, and two because we both liked to just go with the flow. I have done traveling where every day was planned and trips where some things were planned but other days were not. This whole trip, nothing was planned and it was the best experience I have ever had. The two of us learned how to get around the cities pretty easily as well as navigating areas though we had gotten lost a few times. Not once did the two of us panic while we were traveling. After this whole adventure, this has made me realize how much I enjoy moving around the world. Maybe one day I will return to these locations again with more time to explore. I just cannot get rid of my travel bug. Look for a pictures and even a video of my trip very soon on Facebook!!! Sorry I haven’t been consistent with my posts the past 2 weeks but there really hasn’t been anything going except preparing for out ten day break. If I can sum up my past few weeks it would be a lot of stress and paper writing. I just want to let my family and friends who are not aware yet that I will be traveling for the next ten days starting Thursday until Sunday night my time. My friend Dorthea and I have made plans to stay in Melbourne from Thursday night to Sunday night and then fly out of the country to the wonderful Northern Island of New Zealand. We will be staying with my cousin Lindsey in Melbourne and then we will be staying with Dorthea’s cousin who is studying abroad in Auckland. As of now our activity schedule is a but up in the air but what we do plan on doing at least in New Zealand is doing a few days nerding out about Lord of the Rings by visiting the sight of Mount Doom and the little town of Hobbiton as well as making plans with David Duke who was sweet enough to offer us a bit of an inside look at his job working on the set of Lord of the Rings. New Zealand will be more of a hiking trip, and Melbourne will be a bit of an exploring trip, which will be a great way to end my last big traveling plans here on this side of the world. After I will be buckling down for finals. I will plan to write a post the night I get back from New Zealand about Dorthea and I’s adventures during the 10 day break. Be on the look out for some pictures and maybe a GOPRO video. Tagged Australia, Fall 2015, Sunshine Coast | Comments Off on Break Plans! Living on a Prayer, Because I am Half way there! I was told that you don’t always have to have an exciting week. Sometimes the best weeks are the ones that are slower. I don’t completely agree with them but they have a point. 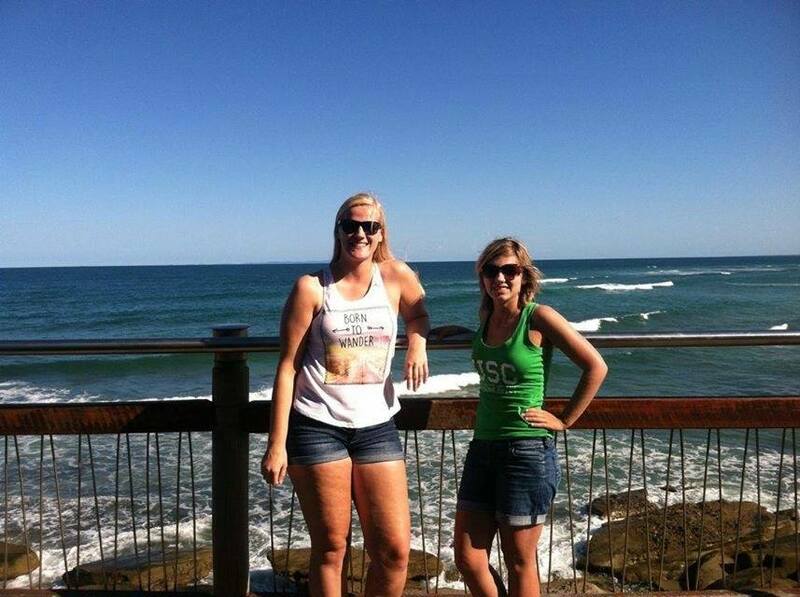 This week was the half way mark of my semester at University of the Sunshine Coast and it really has flown by quickly. Monday was my first big test since I started here. I sat in a room for 2 hours taking my biomechanics test then walked out with a huge headache. It was not a terrible test but I don’t not want to jinx that. Tuesday was just classes. One of them being a lab for physiology where we played with blood again but this time measuring the hemoglobin levels as well as identifying white blood cells. I discovered in that class that I easily get nauseous looking in a microscope but other than that, blood looks beautiful under a microscope. Wednesday was psychology day (all my psychology classes where that day). For abnormal psychology, we talked about addictive disorders which involved gambling and alcohol. As part of our topic for the day, we watched a funny clip of monkeys getting drunk which was hilarious. I always seem to love abnormal psychology. My professor is hilarious as well as clever when it comes to her field of expertise. After class I got to video chat with my buddy Caroline D! All I can say I, we are a pair that do not shut up 😀 Literally right afterwards, I spoke with my friend and future roommate Fran and again we always have so much to talk about! Talking to my Elon friends always makes me miss my home in Burlington NC but my time here will end soon. Thursday was a free day for me because my tut was online so Louise and I went over to Wollies and the post office. I delivered another birthday package as well as got a few ingredients for our BBQ on Friday. Afterwards I headed over to the gym to talk with one of the trainers about how I can tone. Working out to me is more of a way to let out stress but because I like to see a healthy change in my body, I have been wanting to tone. Since I don’t have a lot of fat to lose, it is time to tone and build muscle. As of now I have been given a bunch of exercises in order to work on upper body, legs and core. This does not mean I am quitting the workout classes. I enjoy those too much. Friday I had one tut before going to Wollies with Dorthea, Cara and Liam to pick up shrimp and a cob loaf for the BBQ. Before heading to Maloolaba, I marinated the shrimp and made the cob loaf dip for the second time since I came here. The reason I wanted to make the shrimp is because I wanted to do the whole Australian “shrimp on the Barbie” thing. Funny enough, that is not a real thing they do here in Australia. Some stereotypes are just complete lies!!! After arriving at the BBQ that was facing Maloolaba beach, a group of us ended up at another section of Maloolaba so the few people I was with just decided to stay and cook our food where we were instead of walking. We did have someone who was injured so that was the biggest reason we did not try to walk over. Either way, we had a nice BBQ with burgers, sausages and prawns (that’s what they call shrimp here). I ate most of the prawns, but I was still happy I stuck with the idea. Eventually the other group found us and we all hung out at the tables before catching the bus back to USC. Before bed, Cara, Louise and I hung out with some other friends (two who live upstairs) at their little BBQ at the UniCentral grills. 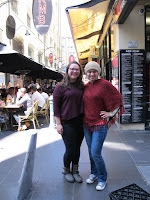 Saturday morning, I met up with Dorthea to finalize our itinerary for our trip to Melbourne and New Zealand for the mid semester break! It did take a little longer than expected with buying tickets due to some terrible customer service from Tiger Airline but we eventually got our tickets. During the booking process, Fil skyped me and was eventually joined by Stu. Seeing them converse with each other definitely made me miss their craziness. They even got a little information of our plans to go to Hobbitan in New Zealand. Again, talking to Elon friends always reminds me why I need to eventually come home. Once Dorthea and I finished, I walked back to my room, did some studying and stayed in the rest of the day. Sunday was a relaxing day but I did have the opportunity to talk to Tray who I haven’t talked to in a while. I guess you can say that part of my highlights this week was talking to my friends back in the USA! They really are the only reason I am okay with coming home (besides the fact I need to graduate). Since I have arrived here, I have also spoken to two of my long time Elon friends Nicole and Alex through text and once through FaceTime as well as many others through iMessage and Facebook both from Elon, and friends from high school. Seeing snapchats of what I am missing back home makes me feel a bit homesick and I am surprisingly developing FOMO (fear of missing out). Though I did not have any crazy things happen to me this week such as skydiving, It was a productive week of school work and catching up with my friends and family back home. In a way, my friend is right about slow weeks. 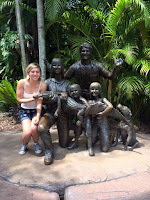 Tagged Australia, Fall 2015, Sunshine Coast | Comments Off on Living on a Prayer, Because I am Half way there! On a fun note before my weekend in Byron Bay, on Thursday, the crew and I went to the sunshine plaza to celebrate Louise’s birthday! August seems to be the month of birthdays for everyone. We went to a popular chain called Grill’d to get some gourmet burgers then went to Coles to pick up some extra things. Afterwards, a few of us went to Louise’s place to hang out and eat watermelon. yes this is how we all hang out. We even had a little fight over the watermelon. Eventually everyone ha to go back and get assignments done. Tagged Australia, Fall 2015, Sunshine Coast | Comments Off on Assignments due and Adventures in Byron Bay!